Sorry for getting to this late - I've been SO busy lately! 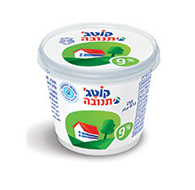 A small number of containers of 9% fat cottage cheese were packaged in containers labeled 3% fat. The product is safe to consume. The lids of the mispackaged cheeses correctly identify the product as 9% fat Cottage Cheese, even though the containers they are packaged in are labeled 3% fat. So you can identify these mislabled cheeses by the confusing packaging.